A pair of impressive Louis Philippe ormolu and patinated bronze column lamps, France, circa 1860. The patinated bronze top surrounded by ormolu leaves, above a gilt bronze Corinthian capital, leading to a fluted bronze column finished with finely cast and chased foliate ormolu mounts at the base. The triform base formed of paw feet sit on a dark green marble plinth. Wired for the UK, the shades are not included. 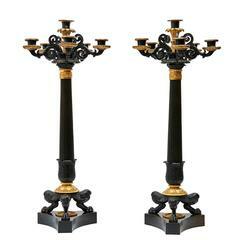 A pair of bronze column lamps with fluted columns and Corinthian capitals, all supported on square bases. An elegant Italian pair of gilt doré bronze and diamond cut crystal, ormolu-mounted column-form neoclassical lamps in the manner of baccarat. Measures: Height 51 cm.